The occasion of Her Majesty The Queen's Golden Jubilee is a time for Canadians to express gratitude to their Head of State for her devotion to duty and to reflect on our growth as a nation during her reign. Over the past 50 years, Queen Elizabeth has celebrated a number of historic events with us during her official visits to Canada, including the Bicentennial of New Brunswick, the Centennial of Confederation, the XXIst Olympiad in Montréal, and the proclamation of the Constitution Act. Her Majesty and Prince Philip made their first visit to Canada and New Brunswick in 1951 as Their Royal Highnesses The Princess Elizabeth and The Duke of Edinburgh. 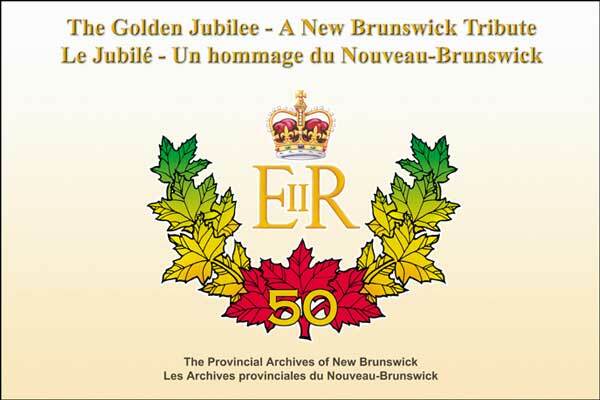 New Brunswick was privileged to host them again in 1959, 1976, and 1984 and to be included in the 2002 Jubilee tour. During their visits, The Queen and Prince Philip have experienced our heritage, culture and traditions; participated in historic ceremonies; and met New Brunswickers from across the province. Queen Elizabeth has requested that her Golden Jubilee be a time of community celebrations and of looking forward as well as back. You are invited, through this exhibit, to reflect on Her Majesty's 50 years of dedicated service and to recall the special moments she shared with New Brunswickers. Click the year you wish to view at the top of the page to display a drop-down list of panels. Choosing a panel from the list will display the images within that panel as well as a description of each image. Click on any small image to get a larger view.